I f you’re a Seth Godin fan, his most recent book, This is Marketing: You Can’t Be Seen Until You Learn to See doesn’t disappoint – and in fact, has quickly become one of my favorites. Godin’s book offers examples of successful marketing ideas but more importantly, shows you how to troubleshoot why your marketing may not be working. A deceptively quick light read, I’ve found myself returning to the book over and over again in the two weeks since I devoured it. Subscription services are all the rage for law firms these days. As I wrote years ago, subscription services offer a recurring stream of revenue and make you sticky to your client. What’s not to like? When we think of subscription services, we often think of a client paying a set monthly or annual fee for a specific menu services -and while, those are types of subscription services, there are many others that are all discussed in The Automatic Customer: Creating a Subscription Service in Any Business by John Warrilow. 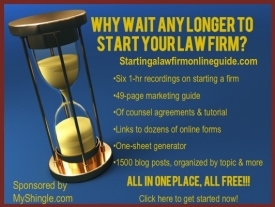 The book covers nine different subscription models, most of which could be adapted for use by a law firm. Warrilow’s book is a quick read with lots of examples from the business world. A strong recommendation if you’re interested in adopting a subscription model. If you’re trying to figure out if your subscription model will sell, you may also want to pick up a copy of Alexander Osterwalder’s book Create Products and Services People Want which contains lots of tips and graphics on how to assess your business idea. But by far, my favorite Osterwalder book and still a perennial on my bookshelf after three years is The Business Model Generation which includes graphic depictions of at least a dozen different business models (including the subscription service model). These too are potentially applicable to law firms and at the very least can inject some new perspective on your business. Today, many lawyers yearn to “scale” like other startups. But there’s something to be said for staying small. That’s the theme of two recent books that highlight the trend in the business world of small, high-profit businesses that don’t intend to get any bigger. The Million Dollar One Person Business by Elaine Pofeldt makes note of the growing number of one person, million dollar businesses and profiles several business owners in different fields who have taken advantage of this trend to build 6 and 7 figure businesses see my review for more details). And coming in January 2019 is Internet entrepreneur Paul Jarvis’s offering, A Company of One: Why Staying Small Is the Next Big Idea . Jarvis is well-known on the Internet and he’s been highly successful so even though I haven’t read the book, I feel confident in recommending it here. M any lawyers are risk averse, more inclined to talk themselves out of doing something than just giving it a try. If you find yourself slipping into that space, Shonda Rhimes’ book, The Year of Yes is for you. Shonda Rhimes, creator of Gray’s Anatomy and many other television hits, describes how saying yes to everything for a year changed her life. And while most of us don’t have lives like Rhimes to start with, the book is a fun, upbeat read and surprisingly relatable. And finally, if you’re going to make 2019 the year you start your law firm, be sure to check out my book, Solo by Choice: How to Be the Lawyer You Always Wanted to Be . Don’t have time for reading? That’s no excuse. Many books are available on audio so you can listen on Audible while driving or exercising. A great way to multi-task. Finally – though not directly related to starting or running a law firm, I wanted to include two more law practice related books on the list that I really enjoyed. First up is Michelle Obama’s extraordinary memoir, Becoming which offers guidance for women lawyers seeking to build a life and career where they can be the best versions of themselves. Second, I’d include Tayari Jones’ An American Marriage, a heartbreaking story about the aftermath of wrongful imprisonment: even when the accused is vindicated, life can’t go back to the way it was before. Enjoy the reads – and best wishes for a Happy Hanukah!